The wording almost makes it seem like they'll be continuing after the regular games end? Not entirely sure. This is why I usually go to the drive through if I'm only getting the free fries. They have to give out the orders in order. I don't think your philosophy of lowering product standards for promotional items is the way to go. It's important to maintain consistency, even during promos and freebie handouts. I bet if you're running a AYCE restaurant, you'd be reheating old food to save money. "Wot wot wot, customers pay $10 for AYCE and still expect something FRESH? Any food at all is a win for them!" free mini blizzard when you download the DQ app! Hrm... I think it's YMMV. The McD's I go to hand out the fries to me real quick, in one instance they called out my order number before I had even pulled the receipt out of the self-order kiosk despite there being 4 or 5 orders ahead of mine. For such a tiny order they get it out first, at least at the McD's I go to. FFS I hate how everything has to be done with an app these days. Looks like free fries again tomorrow! So many fries! And its great to hear that it keeps going into the playoffs too! Last ever fries offer ?? 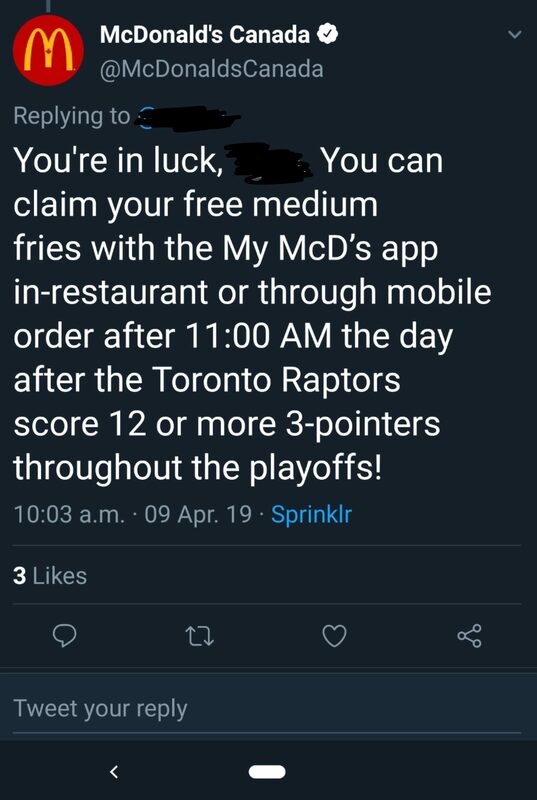 According to the McDonald's Canada Twitter feed the free fries will continue through playoffs.